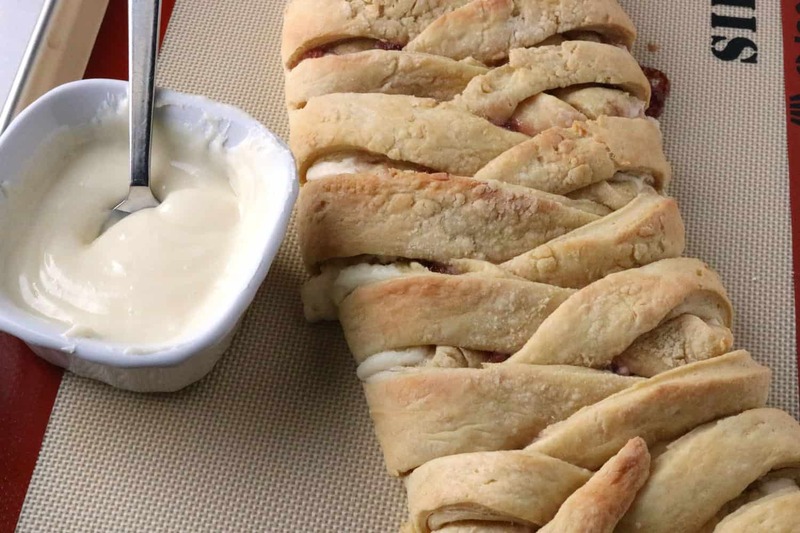 You will love this Easy Cream Cheese Danish recipe. 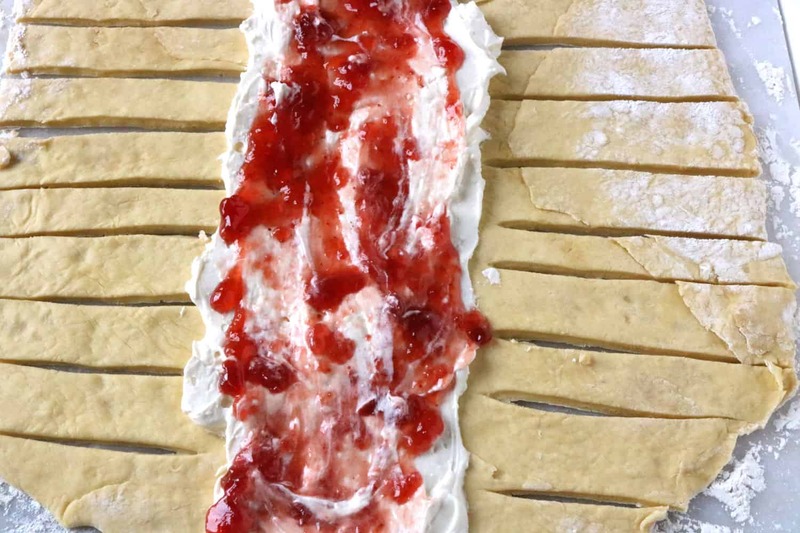 Once you follow the simple steps in this post, you’ll be a Danish Making Diva! Ever since I can remember, I have loved cream cheese danishes. I’m a sucker for cream cheese. What can I say? 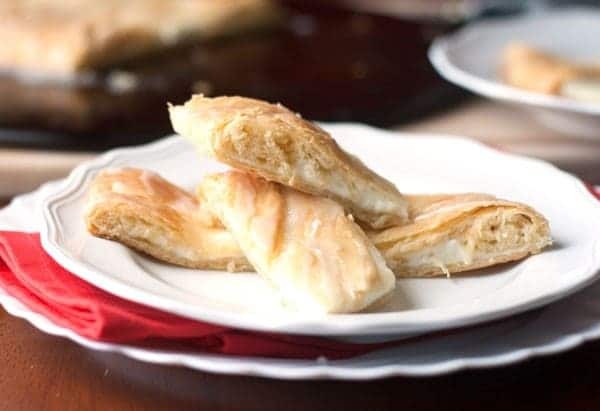 Cream cheese danishes are sweet (because you know the cream cheese is mixed with sugar) without being overwhelmingly so. Tasty without overpowering the bread. And intricate in their simplistic braiding that looks so complicated and refined. Once I learned how to braid dough, I was set. I was a Danish Making Diva! Find a sweet dough you like to work with. I love working with a recipe that has been in my family for years. 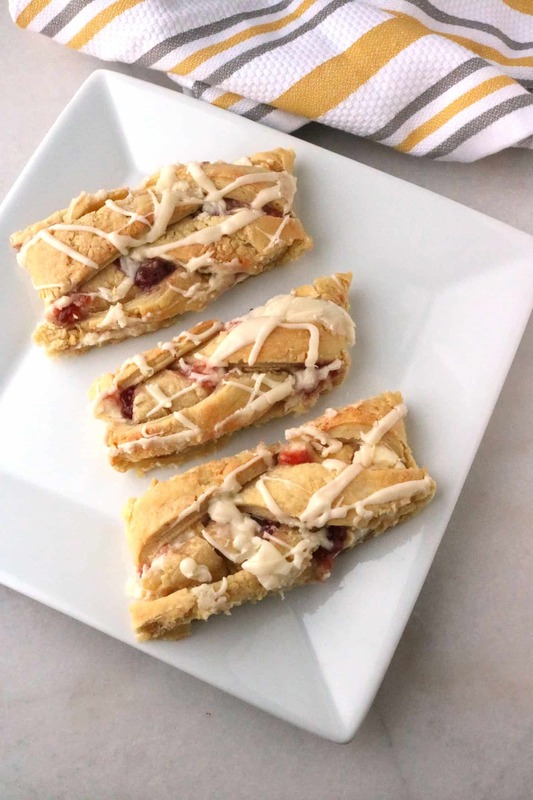 The dough I used in this Easy Cream Cheese Danish recipe is the same dough I use every Christmas to make our traditional coffee cake, Potica. 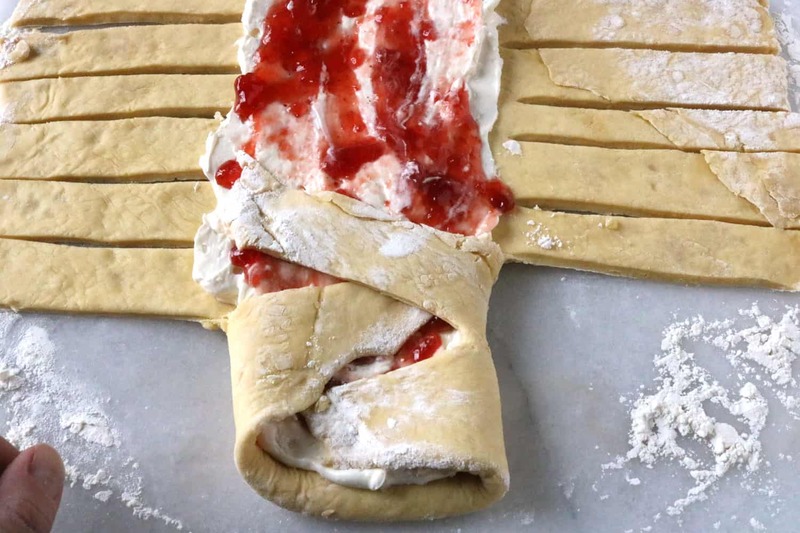 Roll out your dough onto parchment paper so it will be easy to transfer to a cookie sheet. Fill the dough with favorite filling or layer it with a couple fillings like my cream cheese filling and apple pie filling or strawberry jam. Yum! 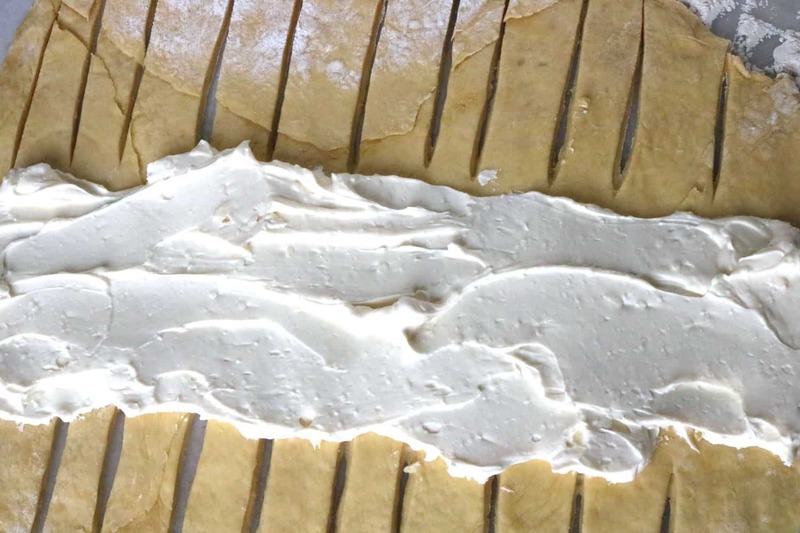 Use kitchen shears to cut the sides of the dough and criss-cross. For more detailed instructions, check out my How to Braid Dough Tutorial. When you’re finished, pop it in the oven and you’re a Danish Making Diva! Told you. The trick to working with this soft dough in this recipe is refrigeration. It will be easiest to work with if refrigerated overnight. Ready for the recipe? Here you go! Let me know if you make it and what you think… and meanwhile: What is your favorite danish/breakfast recipe? This buttery danish uses a simplistic yeast dough that needs to be refrigerated overnight for best results. Heat the butter and milk until the butter is melted. Set aside to cool to lukewarm. In a large bowl, dissolve the yeast in the warm water. Let sit for 5 minutes to activate and then mix in egg yolks. Blend in the cooled milk mixture and then sift in the flour, sugar and salt. With dough hook, mix on medium speed until dough is soft and pliable. Place dough in a large bowl that has been lightly sprayed with cooking spray. Cover with plastic wrap and refrigerate overnight or for about 8 hours. It will rise in the refrigerator. 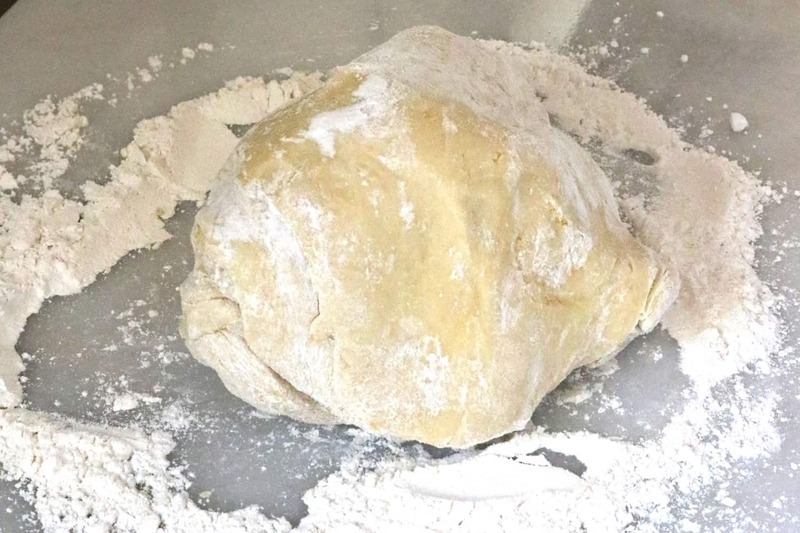 After dough has been refrigerated, remove and tear in half. On parchment paper, roll out into a rectangular shape about 15 inches long and 8-9 inches wide. Meanwhile, soften cream cheese and mix together until smooth with powdered sugar and milk. 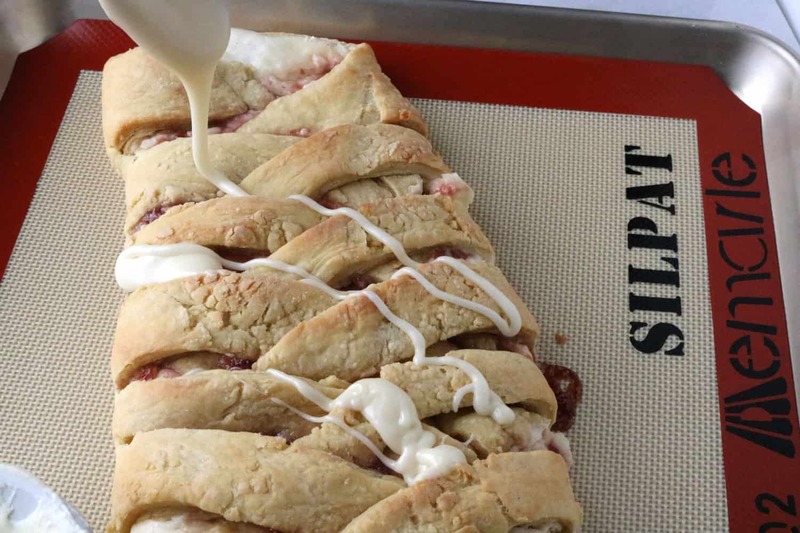 Pour cream cheese mixture down the middle of the dough and spread out to two ends. 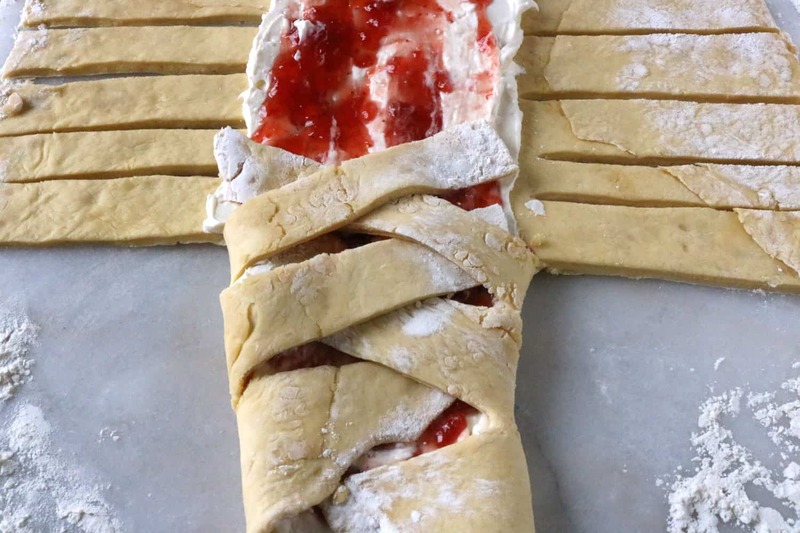 Use kitchen shears to cut strips in dough and braid in criss-cross fashion. For step-by-step braiding instructions, follow this easy dough braiding tutorial. Preheat oven to 350 and bake for 18-25 minutes. This will vary depending on the type of baking sheet you are using. Pizza stones tend to be on the higher end of the baking time. I really like yeast doughs that have butter and milk in them. They are soft and yummy! Me too Deborah! They are the best. These look delicious and really easy for a saturday morning. Thank you so much for sharing. I also blog about cooking and would for you to visit my blog. I hope you have a great day. Thanks! They really are simple. I think I’m going to make these again for tomorrow morning. Let me know if you make them and how you like them. Your welcome! I’d love to hear how the vanilla pudding mix added to the dough works out. Interesting. What kind of glazing are you using on the Danish in the pictures? Hi Doc- It’s powdered sugar mixed with milk. You could also use water, or orange juice if you’d like a citrus taste. Just add a little liquid at a time to the powdered sugar. How much yeast is in 2 packets? I just have a jar. Thanks! I am a bit confused on the recipe where it says to remove the dough from fridge and tear in half – am I to roll out two rectangular shapes of 15 x 8? Hi DD. Yes, there is enough dough to make two pastries. Sorry for the confusion. When you say 2 packages of yeast, do you mean 2 envelopes or two full packages with a total of 6 envelopes? Or do you know the amount it breaks down to Tablespoon wise? Made this for breakfast. Absolutely delicious. Everyone loved it. Better than you can buy anywhere. Thank you! Definitely a recipe to keep. I see the dough makes two, but is the filling for two also? Great question! The filling makes enough for one. I normally save 1/2 the dough for something else. I followed this recipe exactly it came out perfect I wish I could upload pictures. Thank you so much, I added cherry pie filling on top the cream cheese then folded. Hi Michelle- I was practically drooling when I read that you added cherry pie filling on top of the cream cheese. That sounds insanely good! What a great addition. I might have to try that one myself and take some pictures. If I don’t eat them all up first. 🙂 LOL. Blueberry pie filling would be great too. I tryed your recipe and followed your directions, and I have to say it was delicious 🙂 It was only in the fridge for about 5-6 hours instead of 8 and was still great. Thanks for sharing. So glad to hear! I need to make my cream cheese danish again soon. 😉 Have a great week! These look awesome! Danishes are one of those once in a blue moon kind of treats that I only have when I’m at some sort of brunch/breakfast event. I’ve never thought to make them myself, but heck I think I’m going to have to now! I bet they’d be awesome with some fresh fruit baked inside along with the cream cheese :). Sounds amazing!! Thanks for sharing at Happiness is Homemade, you are being featured on Sunday so make sure to stop on over again!